The presence of donor specific HLA antibodies is a contra-indication for renal transplantation. Highly sensitized patients accumulate and often die on the transplant waiting lists as it is almost impossible to find donors towards which they don't have antibodies. The acceptable mismatch program of Eurotransplant has shown to be an effective tool to enhance successful transplantation of highly sensitized patients. However, 35% of the patients have rare HLA phenotypes and no suitable donor can be found. HLA phenotype frequencies vary significantly amongst European populations, as recently investigated within the frame of a European COST Action (BM0803) chaired by Prof. Alicia Sanchez-Mazas. Rare HLA phenotypes in one population are more frequent in other populations. This is where the public health program EUROSTAM funded by a € 2.6 million grant from the European Community (FP7-HEALTH Collaborative project) enters the stage. The major objective of the 11 partners of this project, which includes Professor Sanchez Mazas, is to analyze the feasibility and requirements for a Europe-wide acceptable mismatch program to enhance transplantation of patients with rare HLA phenotypes in their own population. Long waiting patients will be matched with virtual donors based on known HLA frequencies of different European populations and with actual donors from the different transplant organizations. If successful, the logistics will be tested by transplanting some of these patients with donors from elsewhere in Europe. Second objective is to simplify the definition of acceptable HLA mismatches. Although almost 4000 HLA class I antigens are known, only 150 polymorphic residues differentially spread over the different HLA antigens are responsible for the induction of antibodies. 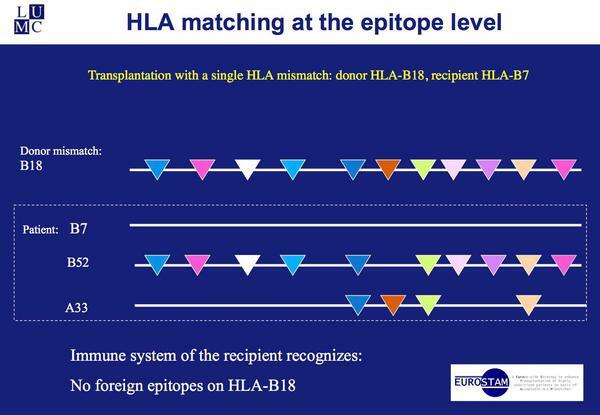 An innovative typing and matching strategy based on the definition of acceptable HLA epitopes will facilitate the identification of suitable donors. Third objective is to define whether antibodies against non-HLA targets on the donor endothelium affect the results of transplants in highly sensitized patients.